My grandmother Joan made these breads for us every time we went to visit. 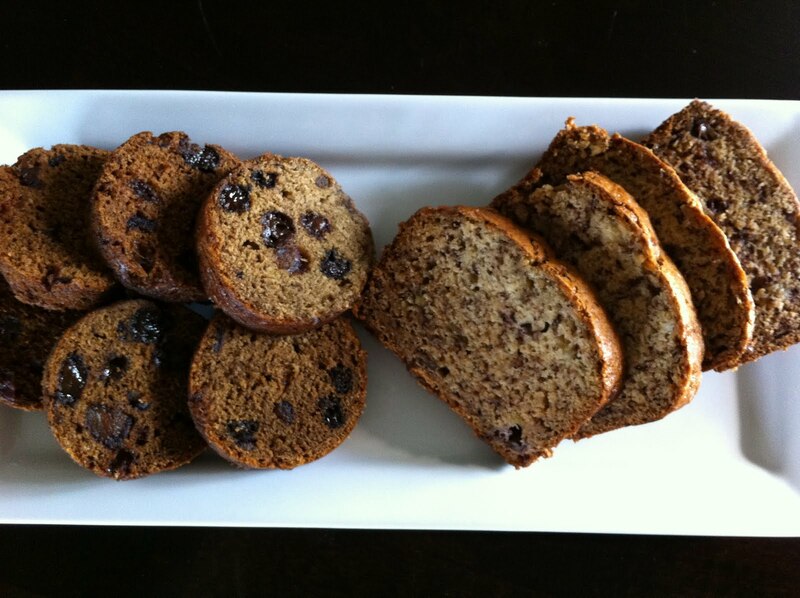 She would prepare a plate with both Banana Bread and Date & Nut Bread. I only had to change one thing in each recipe (can you guess?) They came out just like my grandmother’s! She would be proud! Note: To make the Date & Nut Bread round, my Grandmother would bake in aluminum cans! Save a few cans from whatever (coconut milk, beans), take off the labels and clean them. Make sure they are labeled BPA free! Preheat oven to 350. Bring the cup of water to a boil, add in the raisins and dates, and baking soda. Stir it together and then take off the heat and let cool. Prepare the flax “egg” by whisking the flax and water. Let it stand for a few minutes to get really thick. Combine all of the ingredients in a big bowl and bring together into a dough. Brush the cans with a light coating of oil. Spoon the batter into each can, filling it about 3/4 full. Stand the cans up on a baking tray and bake for 45 to 50 minutes, depending on your oven. The dough will puff out of the top of the can and that is when you can start testing with a toothpick. The tops should be nice and brown! Let cool for a bit. Then, tap the bottom of the can and slide the bread out. Slice it and enjoy! Prepare the flax “eggs” by whisking the flax and water or omit if using applesauce. Let it stand for a few minutes to get really thick. Mash the bananas really well. Combine all of the ingredients in a big bowl and bring together into a dough. Pour into a medium sized loaf pan. Bake for 50 minutes to an hour depending on your oven until a toothpick comes out clean. Let it cool. Slice it and enjoy!